To become an electrician you have to complete an Australian Apprenticeship. An electrical apprenticeship combines training with working in a real job, for a real boss, with a real wage. You will complete a four-year apprenticeship, including the Certificate III in Electrotechnology Electrician, as well as the licensing assessments. An opportunity to learn+earn at the same time. A kickstart to your career. You combine work and study at NECA Education & Careers. You will need to meet the language, literacy and numeracy requirements. While not mandatory, employers are attracted to candidates who have completed a Pre-Apprenticeship. Work experience in a like or allied trade is also highly desirable. Relevant trades include plumbing, general building construction, bricklaying, carpentry, horticulture, electronic security, telecommunications, data & communication, AV technicians, engineering or mechanical trade. 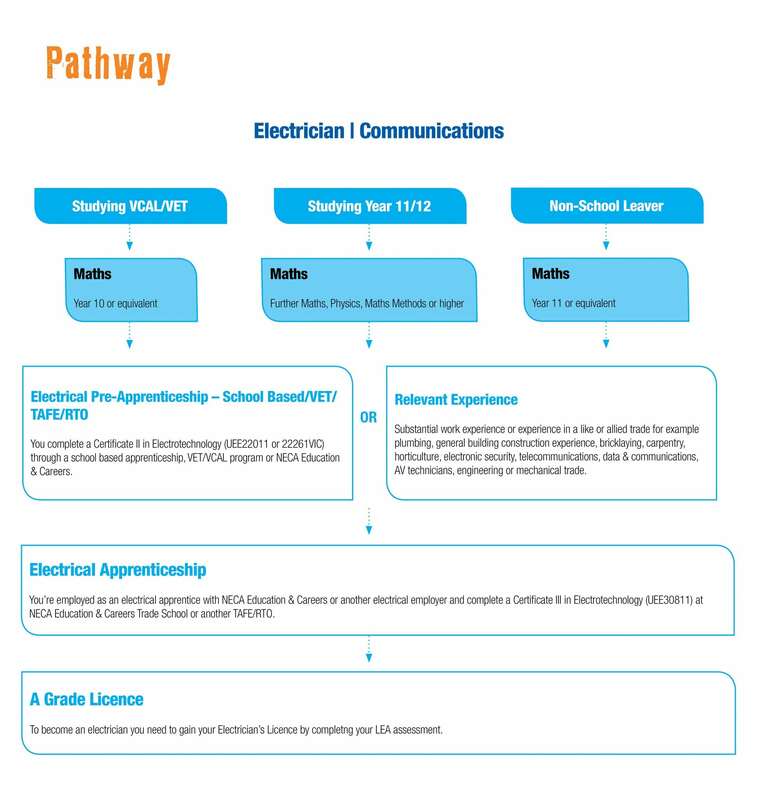 Whether you’re a school leaver, looking for a career change or just finished an awesome gap year, below is the pathway to becoming an electrician. Speak with NECA Education & Careers for more information on becoming an electrician. You can email us at info@necaeducation.com.au or contact us online today.